Pitmaster Josh Cary and Chef Tom Jackson talk about the history of the American, not Italian, classic Spaghetti, and Meatballs, and Chef Tom cooks up some from scratch Italian meatballs with marinara sauce. To prepare the meatballs, combine the ground beef, breadcrumbs, parmesan, egg, garlic and Cattleman’s Grill Italiano Seasoning in a mixing bowl. Mix well by hand, working quickly so as not to warm the mixture, until all ingredients are well incorporated. Roll the mixture into roughly one ounce meatballs. Cook until the internal temperature reaches 160ºF, about 20 minutes. While the meatballs cook, combine all ingredients for the marinara sauce in a saucepan. Bring to a simmer and cook to desired consistency, breaking up the tomatoes with a wooden spoon, as the sauce cooks. 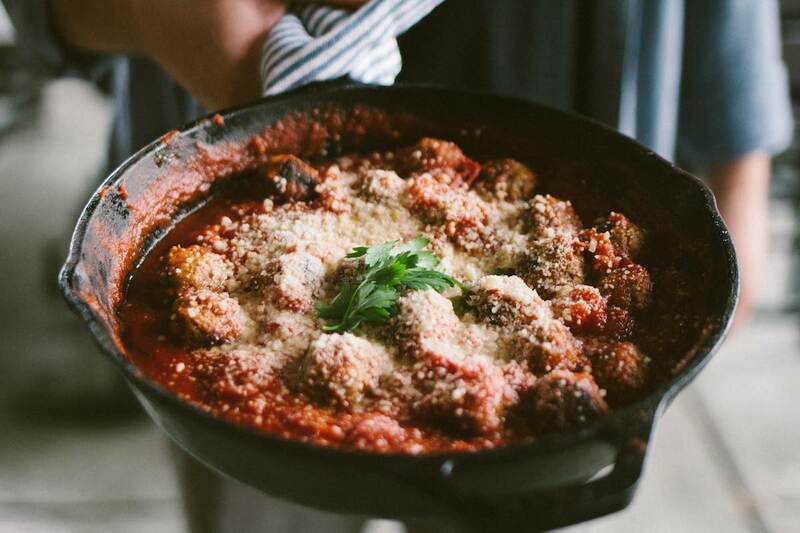 Transfer the meatballs to the saucepan with the marinara sauce. Serve hot over spaghetti.